Andrea Falconiero: "L Infanta Arcibizzarra"
Sonata I "Fuggi dolente core"
Giovanni Batista Buonamente: Sonata X "Cavalletto zoppo"
Girolamo Frescobaldi: Canzone VIII "L Ambiziosa"
By the turn of the 16th to the 17th century instrumental music was passing through a transition not only of style but also of expansion as never before. Although this particular phase produced a torrent of such works, much of this repertoire remains unknown to this day. This is a great pity as many of these pieces are fine examples of the vital changes that were taking place; from the splendid sounds of the Renaissance to the first hints of the glorious baroque. The selection of works presented on this recording is indeed a small treasure chest full of wonderful gems that are worth rediscovering. Some composers are very well known, others are obscure names whose music is no less fine. 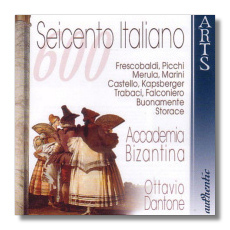 The Accademia Bizantina under the direction of Ottavio Dantone is an ideal ensemble for this kind of music, etching out interpretations full of elegance and colour. The perfect intonation of the instruments is also another 'forte' in helping to bring out all the graceful balance of the many intricate combinations of these compositions. The notes by Giovanni Tosso on each composer are brief, as expected; but nonetheless, the information is enough to give the reader a fair picture of these musicians who helped shape one of the golden eras of European music. An interesting and very well engineered disc that focuses on the main styles and salient forms of expression that started to flourish in Italy some four centuries ago.